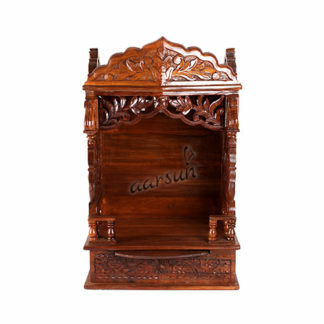 Aarsun Handmade Wooden Door Temple in fine quality wood with fine finishing and beautiful carving. At the top of the wooden temple a beautiful peacock design with OM written at the front. Below that there is fine carving and doors placed at the front of the temple with hanging bells.There are carved pillars at the front of the temple design is been carved at the sides of the temple. There are wooden knob place at the front of the temple s hat you can easily handle the doors.The wooden temple below that there is base area where there is single drawer placed along with sliding tray for placing all your puja essentials. The wooden Temple is beautifully crafted by our skilled artisans and you can place it anywhere in your house and it will give more traditional and elegant look to your home. As we are the manufacturers so unit can be customize as per the requirement of the customer. We provide free shipping across India. Feel free to contact us in case of any other details are required. A wide range of Wooden Temple designs are available in Sheesham Wood Temple .